The show is set in the early 80s in the fictional town of Hawkins, Indiana. 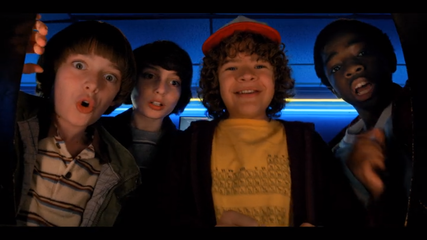 The story revolves around a group of four 12-year-old boys: Mike Wheeler (Finn Wolfhard), Will Byers (Noah Schnapp), Lucas Sinclair (Caleb McLaughlin) and Dustin Henderson (Gaten Mattarazzo). One night, while the boys are playing "Dungeons & Dragons" at the Wheeler House, researchers at a nearby Research Laboratory open up a rift to an alternate dimension, called the Upside Down. With this they also release a monster coming out of this world. Later that night when Will is going home this monster grabs him and he vanishes of the face of the earth. At the same time a young girl (with a shaved head) escapes the Research Facility. The next day Will's mother Joyce (Winona Ryder) and his brother Jonathan (Charlie Heaton) find out that Will is missing and Joyce calls her old friend and the town's sheriff Hopper (David Harbour). Together they set up a search party and o looking for Will. While the boys are searching for Will in the woods, they run into the girl and find out that her name is Eleven (Millie Bobby Brown). Soon they find out that Eleven has psychokinetic powers and that the researchers from the laboratory are looking for her. 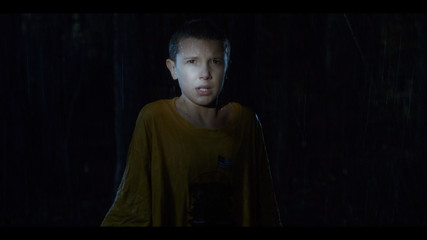 It later turns out that Eleven was taken from her mother while she was a baby, to serve as a human test subject. Eleven claims she knows where Will is. In the meantime Joyce Will is trying to contact his mom through the phone and other electronic devices. When a body is found she refuses to believe that it's Will. She refuses to give up on her boy and at one point, she hears Will's voice through the wall and discovers him behind a membrane. The monster that took Will turns out to be the Demagorgon and he is out for destruction. 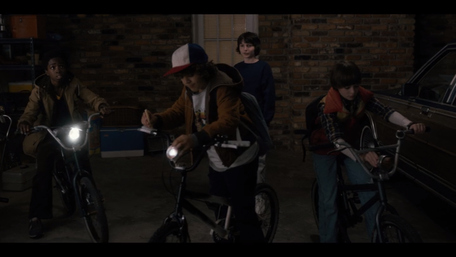 With the help of Elven the boys try to find and save Will from the Demagorgon and get him out of the Upside Down. Will keeps on contacting Joyce through the christmas lights and Joyce convinces Hopper to help her save Will. To do this Hopper has to go into the Upside Down. Eventually things come to a showdown between the Demagorgon an Eleven, resulting in Eleven's sacrifice to beat him. She uses up all her powers to disintegrate the creature and vanishes while doing this. Although the boys (especially MIke, who has fallen in love with Eleven) are heartbroken about the loss of their friend, they are happy to hear that Will is back and that he is ok. But is he? 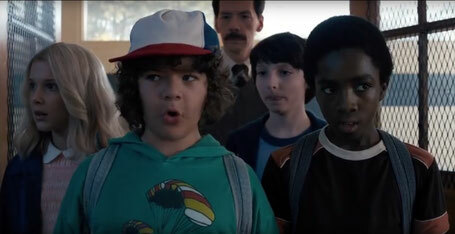 I already said it once or twice, but I keep saying it: the absolute stars of the first season of "Stranger Things"are the kids (especially Millie Bobby Brown as Eleven), they are just great. Apart from this the other actors are perfectly cast too. I was glad to see Winona Ryder back on the screen. She puts up a great performance in portraying Joyce, the somewhat emotionally unstable mother of Will. Ryder was a big star in the late 80s and 90s and she appeared in some great movies, like: "Beetlejuice" (as Lydia, 1988), "Great Balls of Fire" (as Myra Gale Lewis,1989), "Edward Scissorhands" (as Kim, 1990), "Mermaids"(as Charlotte Flax, 1990), "Bram Stoker's Dracula" (as Mina Murray, 1992), "Reality Bites" (as Leilaina Pierce, 1994) and "Girl Interrupted" (as Susanna Kaysen, 1999). The list goes on and on, but in my opinion her roles in "Great Balls of Fire", "Bram Stoker's Dracula" and "Girl Interrupted" were her best. In 2000 Ryder got a well-deserved star on the Hollywood Walk of Fame. In 2001, however, things went south when Ryder was charged for shoplifting. She was prosecuted and got probation and community service. After this she dissapeared from the screens for 5 years. In 2006 Ryder returned to the screens and she appeared in movies like: "Star Trek" (as Amanda Grayson, 2009) and the critically acclaimed "Black Swan" (as Beth MacIntyre, 2010). With "Stranger Things", Ryder seems to be back for good and I couldn't be more excited about it! I also really liked David Harbour in his role as Jim Hopper, the sheriff of Hawkins. Hopper lost his daughter to cancer at a young age. In the aftermath of this terrible loss he divorced his wife and started relying on alcohol and prescripted medicine to get through the day. I really loved his scnes with Joyce and the scenes in the police station, with his colleagues. 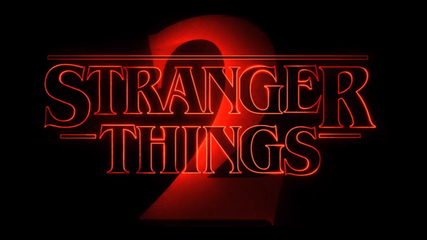 Well to make a long story shorter: I was blown away by the awesomeness of "Stranger Things" and was very excited when a second season was announced. A few months ago, Netflix came with a release date for season 2 (and a teaser): 27 October was the day! Fortunately this was a Friday and that is my day off. My brother also had a day off and we decided to watch together. Popcorn...check, snacks...check, drinks...check, Netflix...check. Approximately 9-10 hours later we turned off the television, we binged the whole season. And I can tell you one thing, the Duffer Brothers delivered. They set the bar very high with the first season, but they passed with flying (pastel) colors. The story is set about 1 year after the events of season 1 and everything seems to be backto normal. 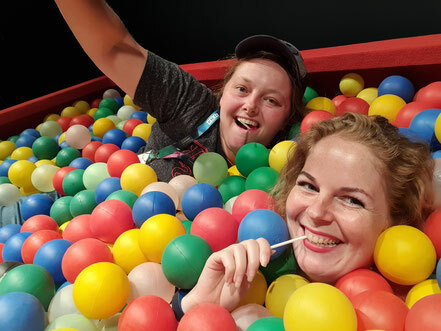 The boys agree upon going to the arcade hall together and they seem to have a great time. at one point however Will seems to be stuck between two worlds. He zooms out and seems to be back in the Upside Down. When he walks outside he sees something in the sky, which makes the Demagorgon from last year look like a puppy. At that moment Mike grabs his shoulder and asks him if he is ok. Will snaps out of the Upside Down and goes back inside with Mike. In the 9 episodes that follow, we go back to Hawkins and meet new people, see all the familiar faces, find out what happened to Eleven, find out more about the test program at the Research Laboratory and seek justice for Barb! In the second season of "Stranger Things" we see a lot of familiar characters from season 1, but there are some new faces. One of them is Sean Astin. In the second season Astin plays the role of the gullible Bob Newby (superhero), Joyce Byer's new love interest. When I heard Astin joined the cast of the show for season 2, I was very excited. I've had the pleasure to meet him twice in the last year/year and a half and he was just great. 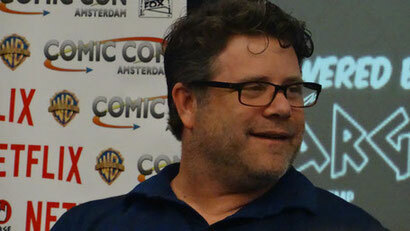 Sean Astin is mostly known for his roles as Samwise Gamgee in the "Lord of the Rings" trilogy and of course for his role as Mikey in "The Goonies" (among others). The Duffer Brothers noted "The Goonies" as one of the show's major influences and that's what makes Astin's appearance so cool. Bob even makes a Goonies reference in episode 5, when he is talking about a pirates treasure. When Astin first heard about the Duffer Brother's interest in casting him Sean hadn't seen one single episode of the show. People had been telling him it reminded them of "The Goonies" and he was planning on watching it. When he heard about the audition, he binged the whole season and he instantly loved it (just like the rest of us). He also mentioned that when he saw the boys riding on their bicycles, it immediately brought him back to his time on the set of "The Goonies". Another familiar new face in season 2 is Paul Reiser as Dr. Owens. When I was younger I always used to watch "My two dads" and "Mad about You" and I really enjoyed watching him in these two shows. Just like Astin, Paul Reiser is a great addition to the cast. Your article is very nice thank you for share this information. 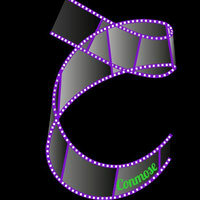 Its very useful for all peoples there are all possibilities to provide for this blog. I just got to this amazing site not long ago. It’s really very nice and I will only say thanks for sharing this great information with us.